Happy Monday! 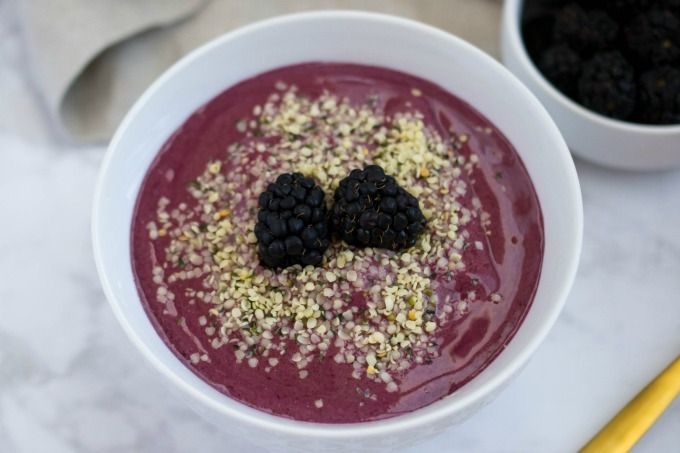 Today I wanted to share a quick and easy recipe for a blackberry smoothie bowl. To be honest, my inspiration was the gorgeous color of some blackberry smoothies on Instagram. 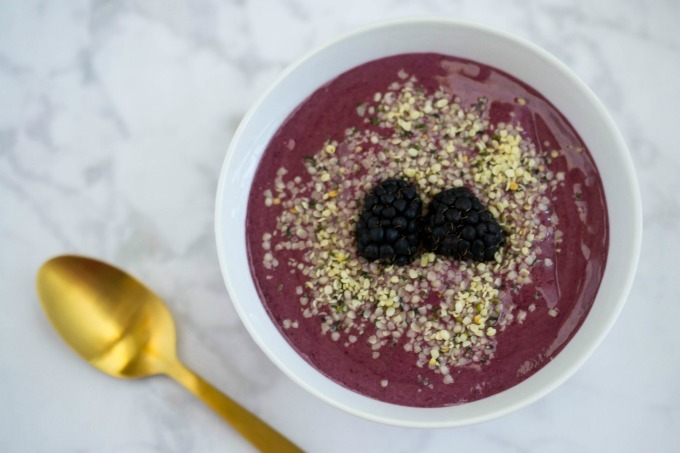 But, blackberries are also packed with antioxidants and Vitamin C, which makes this smoothie bowl a great choice for its health benefits, too. I almost never add sweetener to my smoothies and smoothie bowls because I’m used to the mildly sweet taste. Because the blackberries don’t naturally have a ton of sugar in them (unlike mangoes or bananas, for example), you may want to add some sweetener if you prefer. Stevia, agave nectar, and honey would all work really well. 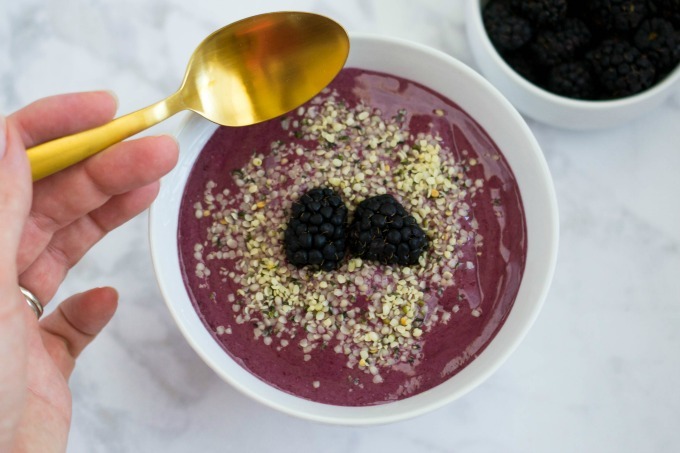 I added chia seeds to the smoothie bowl mixture and topped it with some hemp hearts to help add in some healthy fats. 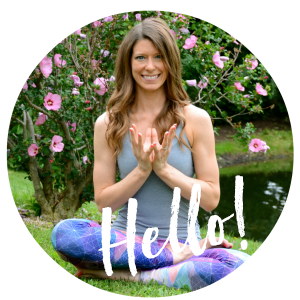 These fats are not only great for things like helping brain function, but they can also help your body absorb fat-soluble vitamins. 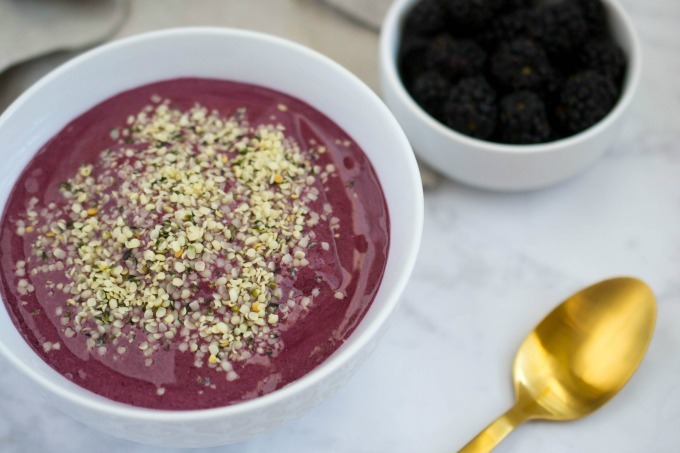 This smoothie bowl takes no time to make, making it perfect for busy mornings. If you prefer an actual smoothie, you can either let the ingredients thaw a bit, or you can add an extra quarter or half cup of almond milk to the recipe. Blend all ingredients together until smooth. Pour into bowl. Optional: top with ingredients of your choice such as hemp hearts or fresh blackberries. Substitute whatever milk you like: coconut, soy, cashew, or cow's milk. YUM! I think this could be what finally convinces me to really appreciate blackberries. I must try it!! Could you try this with greek yogurt instead of almond milk or even regular milk?